While making and watching our 2014 Year in Review slideshows, I was again reminded of how much I have to write about. I want to move away from travel-logging, but at the same time I do want to have a written record of the trips we’ve taken and other headline events, because they are definitely worth remembering. So that’s what I’ll write about until I catch up. 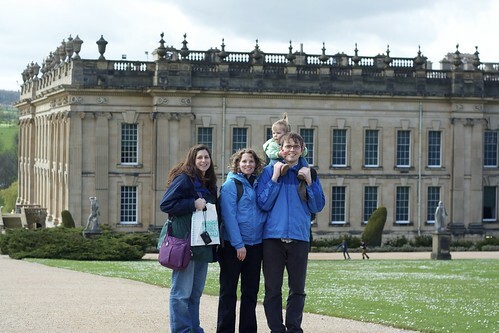 Last spring during Elena’s Easter Holiday, we had the good fortune to welcome Leisa, Sam, and Vera to Yorkshire for a few days before we all set off together on a trip to the Basque country in Spain. They had some happy news to report upon arrival: Leisa was pregnant! Of course, since Jenny was also pregnant, that only increased our anticipation of long car drives and airplane flights. 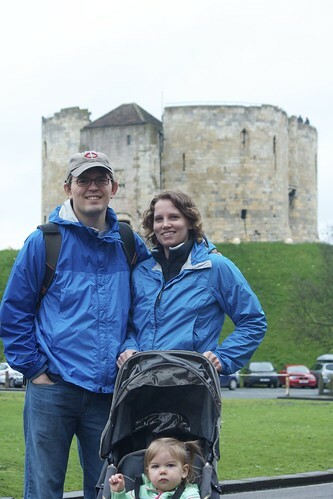 In addition to showing them around some of our usual Harrogate haunts, we took them to York. 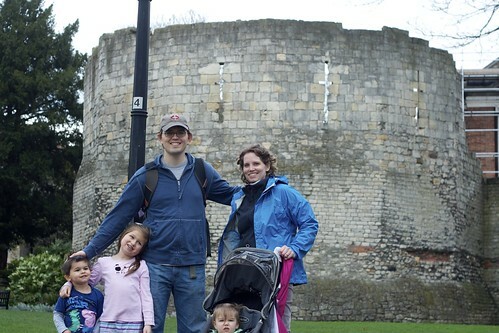 We don’t spend a great deal of time in York, but we do go there reasonably often, and we always seem to find something new and interesting to do, which is impressive given its relatively small size. 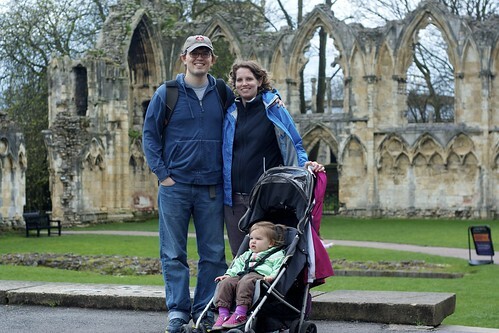 This time, we visited two museums: the York Castle Museum and the Yorkshire Museum. Despite its name, the buildings that house York Castle Museum were never part of a castle—the castle it was named after was originally built by William the Conqueror and was not preserved. In fact, the museum used to be a prison. The museum focuses on what life was like in the not-too-distant past; they have a reconstruction of a Victorian High Street, rooms on display that depict what life was like for different segments of society during the Victorian era, a history of toys in the twentieth century, and a large display about how wedding customs and traditions have developed. As is common in many museums, they had a children’s activity where we answered questions about different exhibits and used the answers to put together a mystery word, then once we had solved all the puzzles the kids earned a special Easter treat. This may have been the first time that Elena really got involved in doing the activity. By contrast, the Yorkshire Museum focuses on the distant past: from prehistoric times and early inhabitants through the Romans and Vikings and on up to the medieval and Elizabethan eras. It’s always fun to talk to the kids about Romans, and whether or not Roman is a Roman. Some of the artefacts’ descriptions had notes about the rules of treasure trove, which was a term we had to look up because the legal meaning is quite different from the metaphorical usage with which we were more familiar. 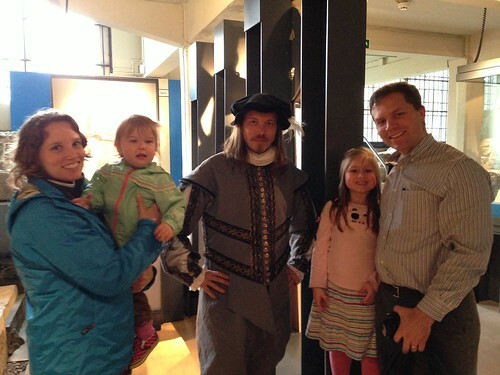 In honor of the 450th anniversary of Shakespeare’s birth, we found an actor portraying Shakespeare in the museum. He helped Roman and Elena (along with some other children) act out a scene from a play he was “working on,” which turned out to be a scene from Macbeth. Although the content was probably a little more grown up than was totally appropriate, the kids didn’t seem to mind and it was all in good fun. Moreover, it was good to have an engaging indoor activity at that particular moment, because a spring shower had appeared out of nowhere. Our day concluded with a brief visit to York Minster, followed by Sam getting a taste of driving in the UK—following me through the windy streets of York must have been a trial by fire! One of the newest installations is a hybrid between art and science. It’s a corridor where the wooden walls are embedded with different genetic patterns; one for the common DNA of humanity, another with the particular genomes of the current Duke and Duchess. Even to a Duke, Royal visits are a big deal. The most ornate room in the house was created in preparation for a visit by King William III that never ended up happening! Chatsworth and its family were deeply affected by the Second World War. One room was set up as it would have been when Chatsworth served as the refuge for a girls’ boarding school. 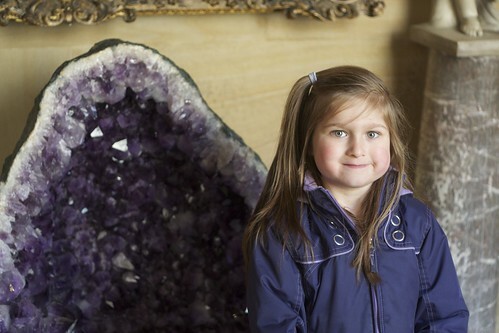 The docent in that room was very nice to Elena, inviting her to sit on one of the beds. It took decades to recover from the war, after the Duke’s heir died in action and the steep estate taxes had to be paid, while at the same time the living family members had doubts about the viability of Chatsworth or any of the great houses in the modern world. Lucky for us, they resolved those issues and Chatsworth is well-managed and thriving. We managed to interest Roman and Elena in some of the things in the house, but they were ready to get outside long before we were done looking around. 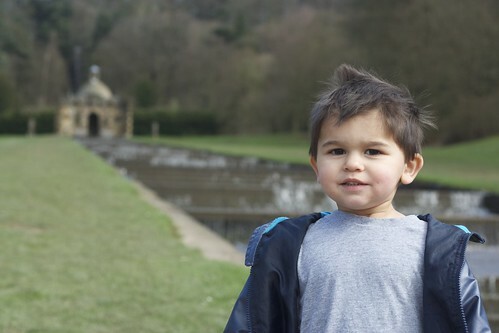 They just wanted to run around the grounds and get as close to the giant cascading fountain as we would let them. 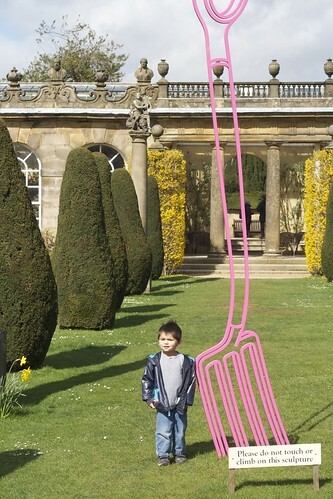 I was fascinated by the art installation on the grounds; giant neon outline sculptures of farm tools. 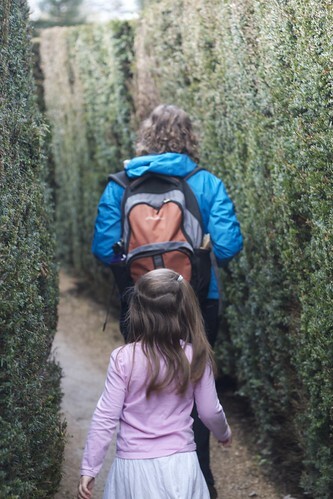 We found the hedge maze and managed to get all the way to the victory platform in its center, but as soon as we got out we realized that if we wanted to see the cow milking display all the way at the other edge of the property, we would have to hurry. As pregnant as she was, Jenny was not up to moving that fast and sent us along ahead. We made it just in time, and it was definitely worth it. 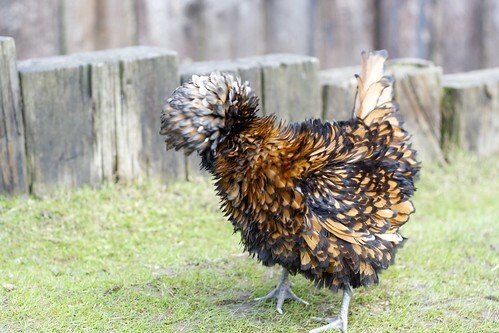 Even better were the numerous pens filled with rare and fancy poultry, which, I later learned, had been a particular interest of the dowager Duchess. Best of all, at least for Roman and Elena, was the tremendous adventure playground, a great reward for them after putting up with silly grown-up activities all day. It had a trampoline, an Archimedes’ Screw that Elena figured out all by herself, and some very tall platforms, walkways, and slides. I thought the slides might be too much for Roman, since they were at least 20 feet tall, but he was feeling daring, because as soon as he came down, he just wanted to climb back up for another turn. It was a very full day, but there was even more we could have done if we had just had the time. But it was time to leave, and make our way to our stop for the night and get some sleep, prior to the unnaturally early wake up time we had to set in order to make our flight the next day.